I can’t come up with many words for what went down today, and if I ask Gregory for any assistance I just get “puuuuumping”. 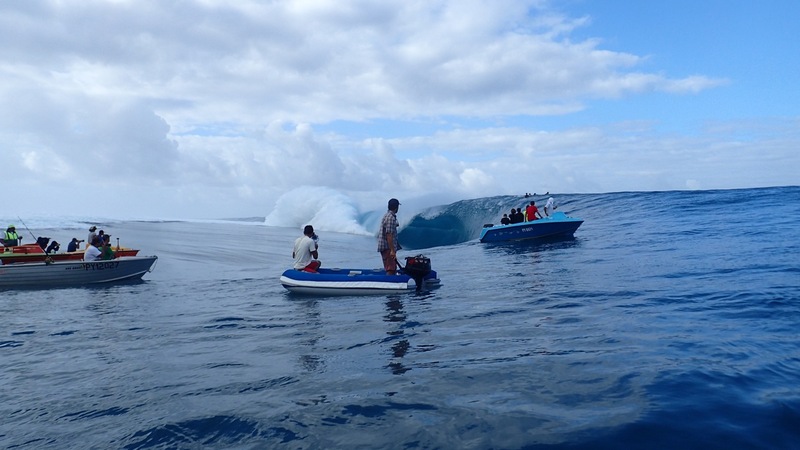 Today we spent well over 5 hours in the dinghy on the shoulder of Teahupoo. The huge swell showed up, as predicted, and the wave was going off! 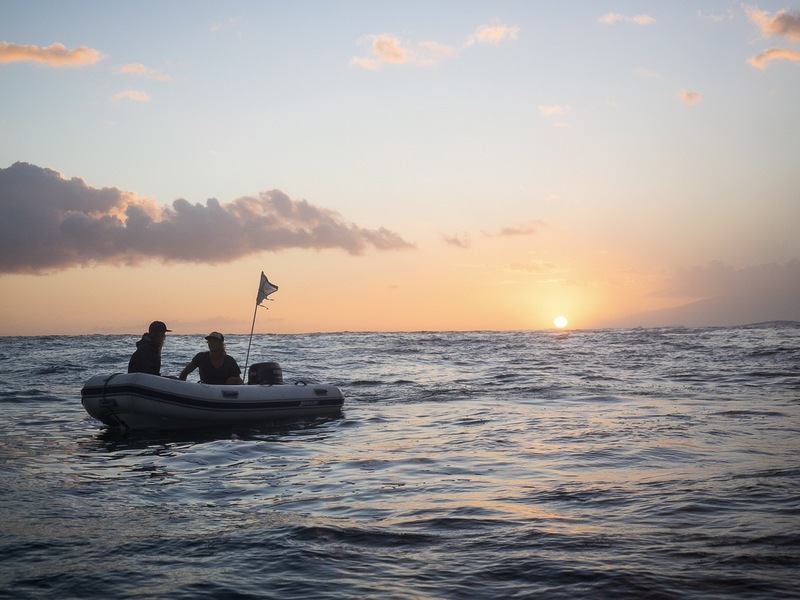 The waves were so big that they were on the brink of no longer being able to paddle in and having to move to tow-ins. As a wave grows in height so does its speed, and once the speed reaches a certain point it becomes impossible for a surfer to paddle fast enough to “catch” the wave. A person simply can not pump their arms quick enough to match the wave in order to pickup the peak. So today the lineup worked hard to catch the monster waves they did. 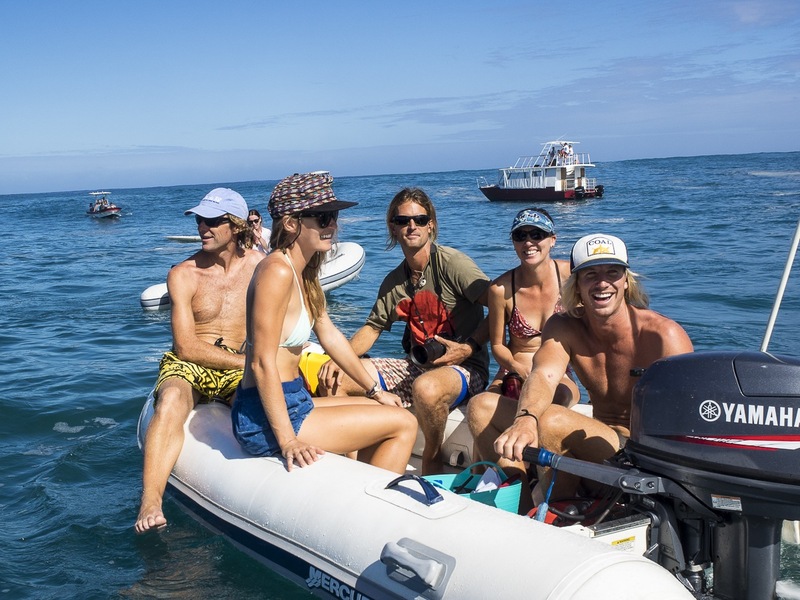 Every successful ride was met with cheers and applause as the surfer triumphantly escaped the closeout section into the relative safety of the growing pack of spectating boats. The misses and near-misses were marked by equally loud gasps and groans from the floating crowd. Speedboats full of pros and their cameramen jostled with tour boats brimming with enthusiastic vacationers for the best viewing position. 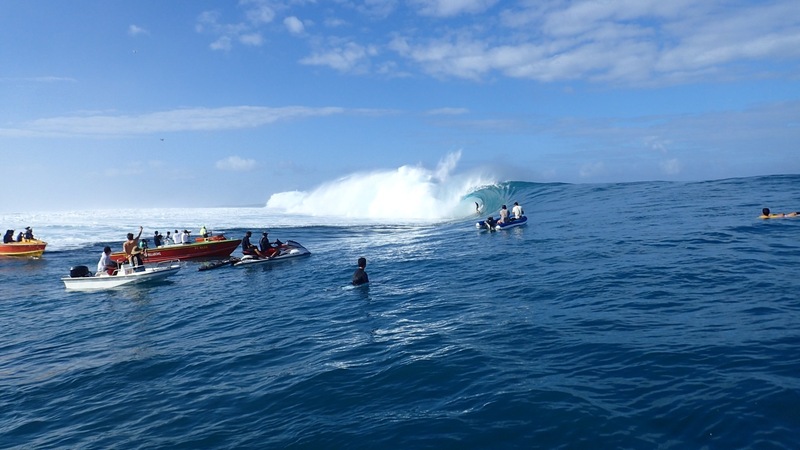 Jetskis buzzed around depositing new riders or rescuing fallen heros from the merciless reef. 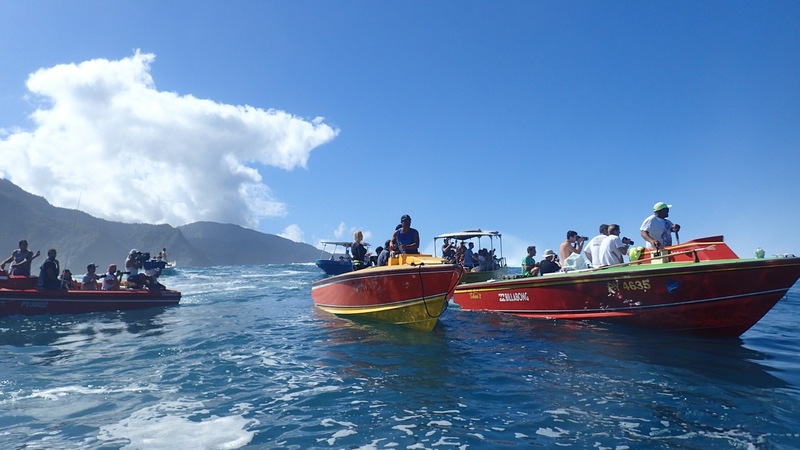 And sprinkled amongst this boat mayhem were us cruisers, in our dinghies. Surfers and body boarders alike sat in the lineup scoping out the incoming waves. 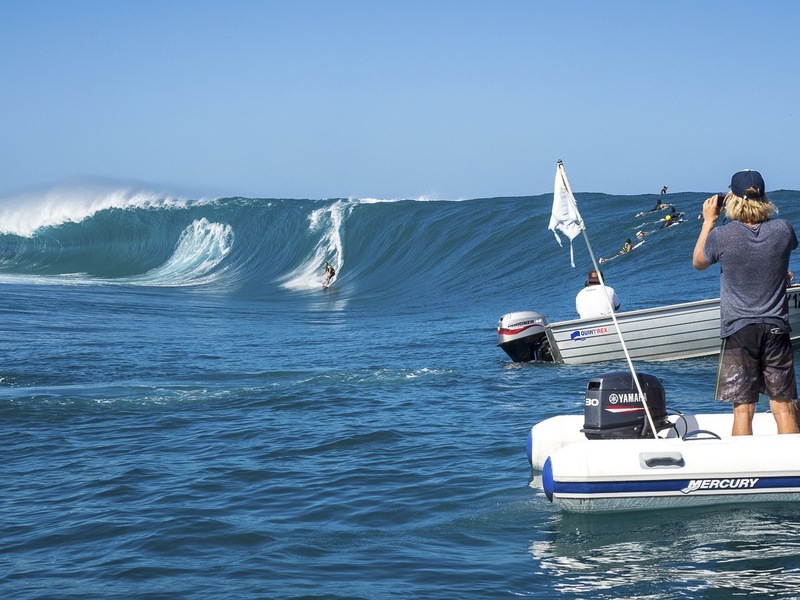 We’d watch as they’d pull out at the last-minute, or air drop 10 feet into the barreling wave. 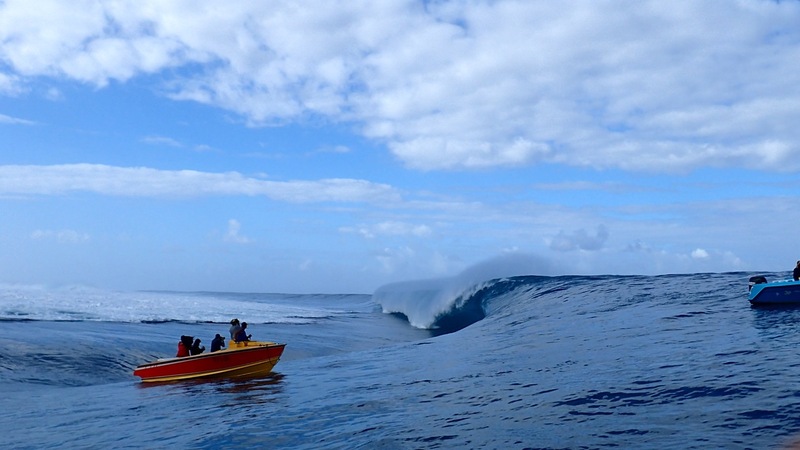 Then once and awhile, as a monster formed way out in the deep, we’d watch as an upright surfer would tow-in behind a jetski to catch an absolute goliath. 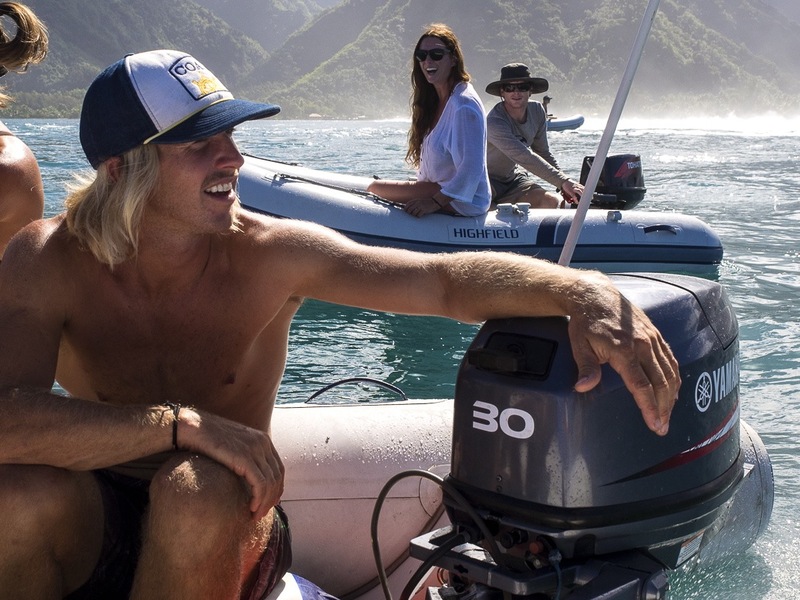 Before today I had never seen a surfing tow-in, and honestly I barely grasped the concept regardless of Gregory explaining it to me time and time again. Now that I’ve seen one though, I’m just as baffled and I’m still just a. Yet I can’t decide who has got the bigger balls – the surfer or the guy driving the jetski. Andy, Megan, and Justin rented a car to come down from Papeete to join us. With Annie and Tab from Asgard, and Josh and Adam off Kuhela all there, we had plenty of friends about to scream our speechless superlatives to. 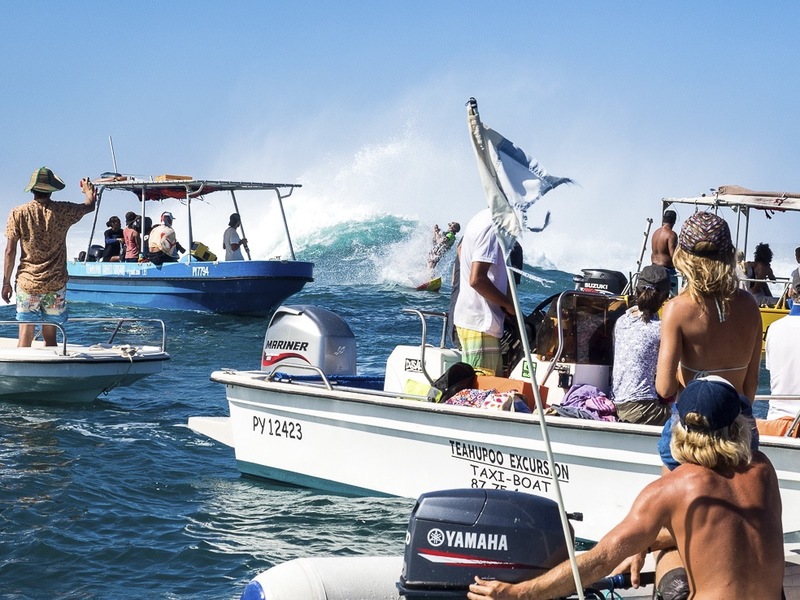 Most conversations were yelled not to be heard over the engines and breaking surf, but to attempt to convey the awesomeness of the day. After a rest from all the excitement we went back for sunset. The crowd was gone, but the wave was still firing. Ceaseless Mother Nature was putting on a show not caring if there was anyone there to see it. A strong, beautiful, and mesmerizing show like only Mother Nature can do. Boat placement was key to snag the perfect photo, but man was it work! Gregory had to have Marie forever on the go to stay in the action and stay safe! Our crew! Andy and Megan from Wairua came down with Justin. Heaps of boats, and heaps of waves. That’s a very heavy lip on that wave. Stephen wouldn’t want to be “going over the falls” on that one. Gregory in his happy place. Standing up in the barrel. Successfully escaping the wave into the safety of the boats, and obviously utterly stoaked about it. 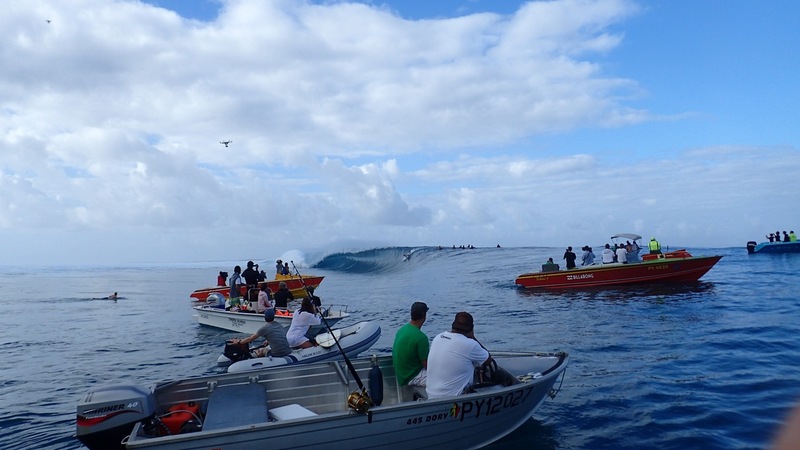 The red and yellow boat was full of pro surfers, while the red boat beside it was full of their cameramen. Gregory getting the magic on film. 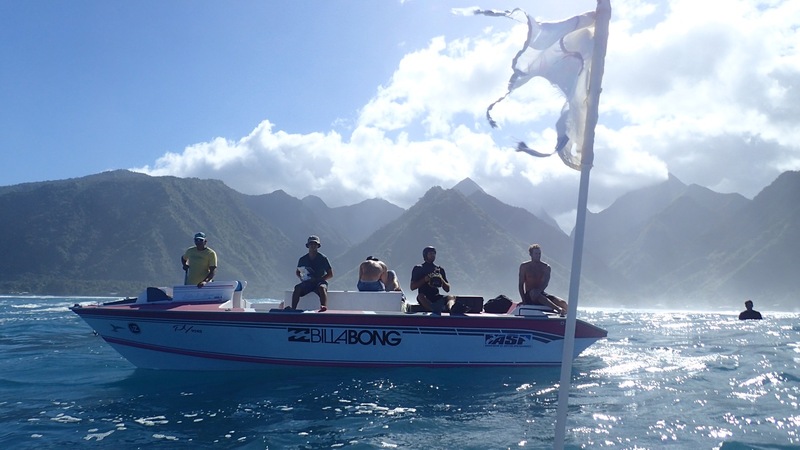 Marie’s signature (ratty) dinghy flag with the stunning Tahiti landscape in the background. Gregory’s favourite shot of the day, and for good reason. 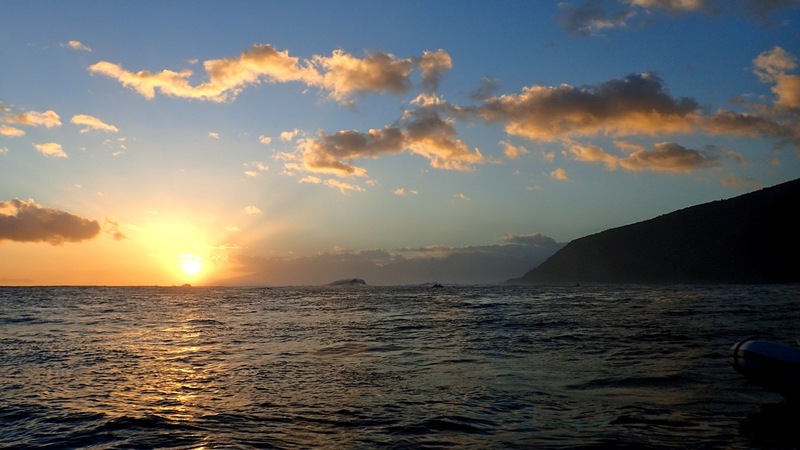 This was when we went back out to the break for sunset. The crowd was gone and the wave was breathtaking. Thanks to Adam for this shot along with a bunch of the others! Fantastic shots! Scary stuff right up Greg’s “alley”. We only saw Teahupoo from the distance on our drive around Tahiti. We did see humpbacks off Bora Bora. Glad to see you guys are safe and still having a ball! !